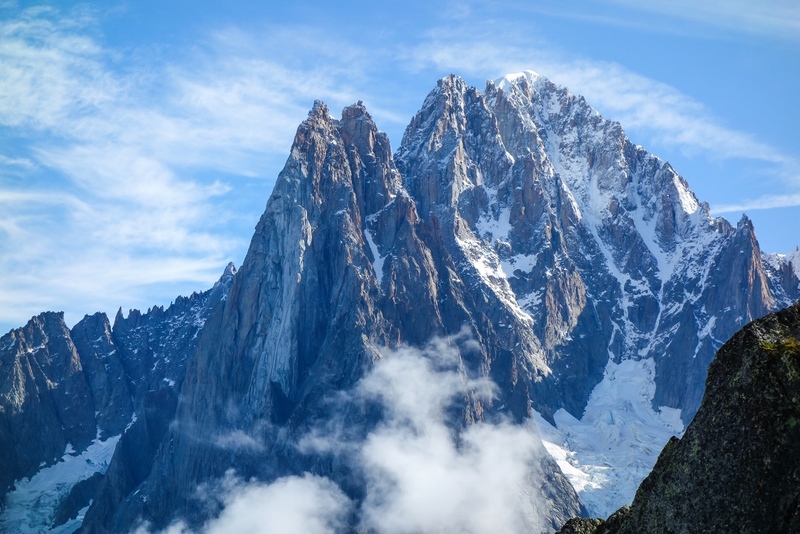 Watching the weather during the months leading up to our trip to the Mont Blanc massif, one could be forgiven for despairing – continued reports of cold, wet, stormy weather didn’t inspire confidence that we would achieve much. Accounts from friends of snowfall to low levels and having to climb routes in pouring rain, just to get something done, was worrying at best. So it was with great relief and not an insignificant amount of smugness, that we touched down in Geneva ahead of the best week’s weather Chamonix had seen all season. Result! 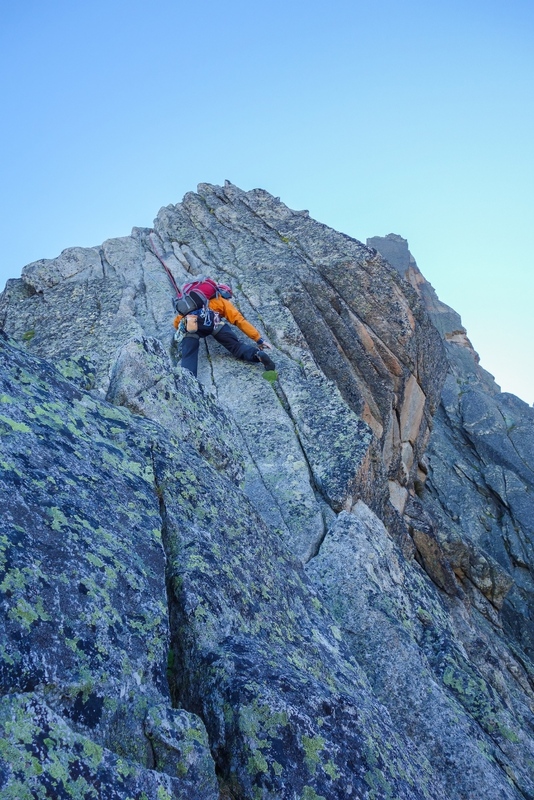 First up was the classic “training” climb of the NNE Ridge of the Aiguille de l’M. 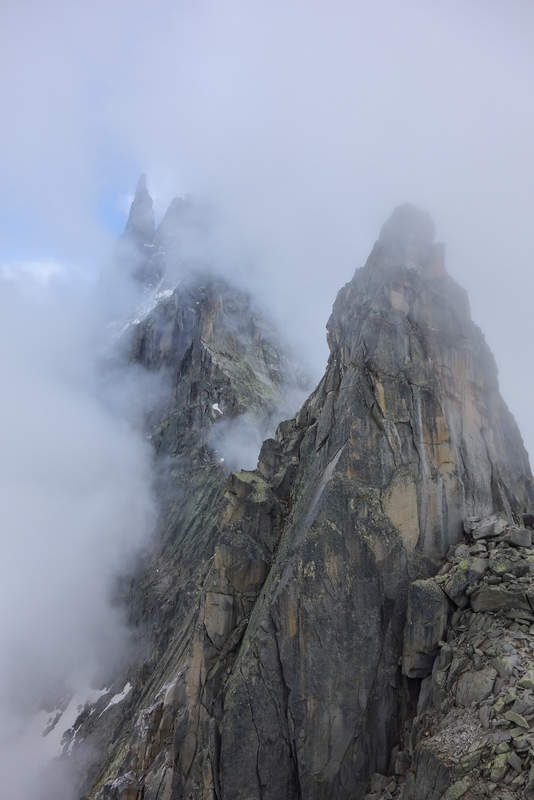 This route follows the left hand skyline of the prominent M-shaped peak as seen from Chamonix and being relatively short and of modest difficulty we decided it was the perfect warm-up. However, after a later-than-planned lift up, a 2.5 hour slog across endless moraine and our arrival at the base of a cold, damp route, we suddenly didn’t feel so optimistic…. Lachy, Debs and myself climbed well at first, managing to keep pace with Andy and Ric in front of us. 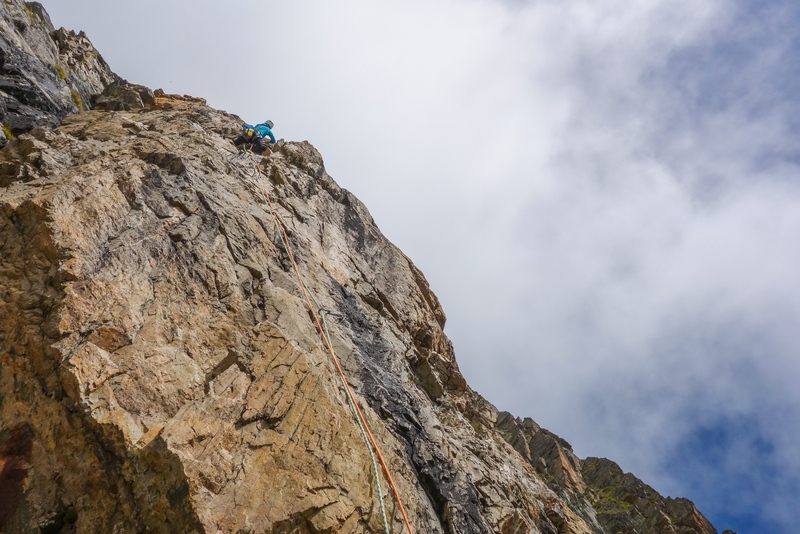 The insanely polished corner of the third pitch, however, provided quite a battle in the damp and chilly conditions and by the time I had started up the continuation cracks above, Ric and Andy were out of sight. In my haste to pick up the pace I inadvertently missed the traverse the guide book warns of and ended up in a soaking wet, smooth groove. I eventually aided my way back on route and we finished the final pitches to the summit in better style. By now we had resigned ourselves to the fact that we would never descend and make it back to the lift station in time for the final lift and so we relaxed on the abseils and scrambled carefully back down to the glacier. By the time we had walked back down to Chamonix we had descended nearly 2km vertically and our legs certainly knew it! 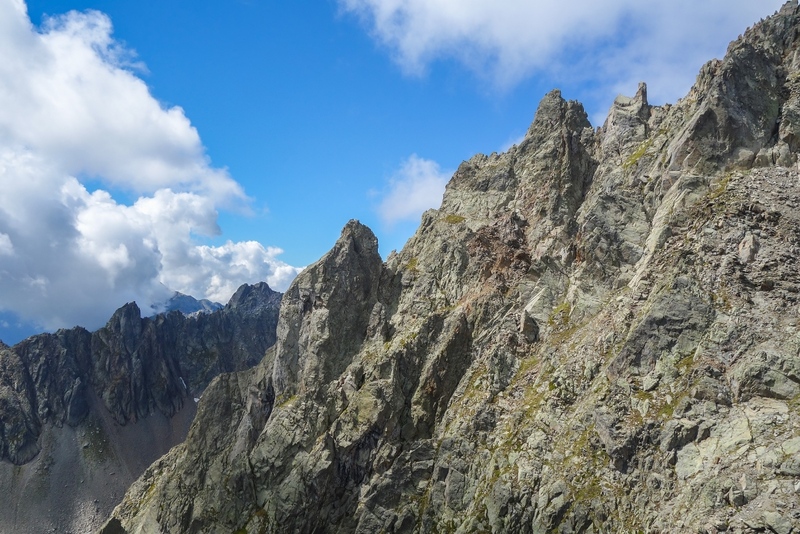 Day two and our bodies were in need of a less traumatic route so we opted for a day on the sunny side of the valley and headed up to the Aiguilles Rouge for the SE Ridge of l’Index with the Voie Brunat-Perroux start. The weather was superb and afforded views of climbs we had done last year. Can you spot the climbers on the classic Chapelle de la Gliere? We made good progress climbing as a three and finished only slightly behind guidebook time. The route is very popular being so close to a ski lift and the traffic has resulted in the crux becoming notoriously polished and slippery. That said, we were all impressed by the quality of the rock and the climbing; abseiling off with smiles on our faces. That night we decided that the good forecast required an adventure on a big route in the centre of the massif. 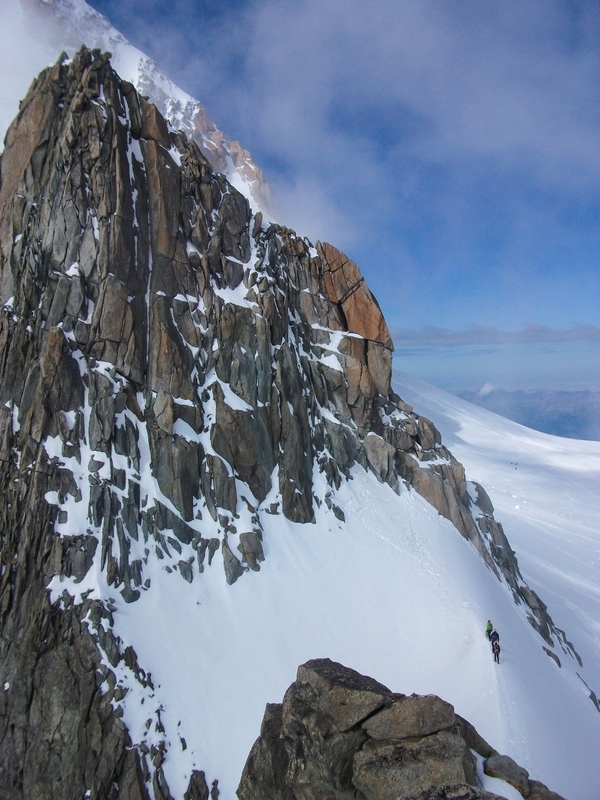 We chose the South Ridge Integrale of the Aiguille de Moine and packed for a couple of nights at the Couvercle Hut. The next morning we awoke to fresh snow down to ~2500 m and once again examined the forecast. The prediction of sub-zero daytime temperatures at the elevation of the route and the knowledge we would be starting the climb in the bitter pre-dawn cold, made us decide against it. As time was getting on and with no plan B, we sprinted to the lift station and shot back up the Index chair for a route on the Floria. Ric and I jumped on the excellent Madagasikara and left the deck at midday. By 15:00 we were back at the bottom of the cliff wondering if we had time to squeeze in another before the last lift down at 16:45. 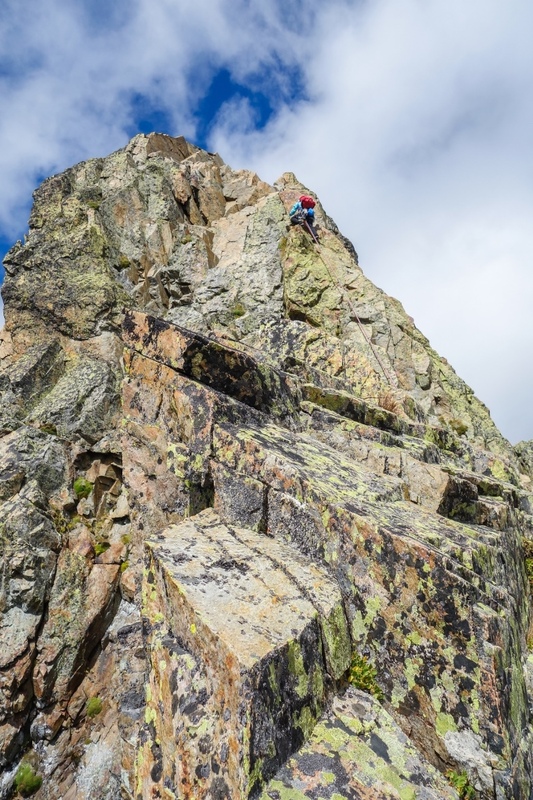 We gambled on the brilliant looking edge line of L’arete Rouge (Eperon Sublime) without paying too much attention to the guidebook and went at it. 90 minutes later we were quivering at the top after 5 sketchy run-out pitches and with 15 minutes to make the lift. We caned it down the scree and sprinted for the lift station, arriving at 16:46 to a laughing lift attendant and the easy way back to the valley. 12 pitches and 2 descents in under 5 hours? Not bad for an afternoon! 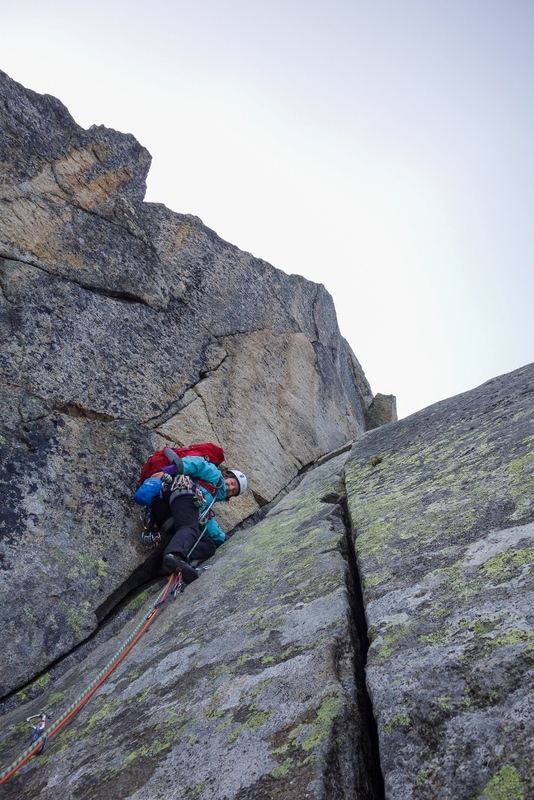 Day 4 and the continuing chilly temperatures at altitude called for another mid-elevation rock climb, but this time on the Chamonix Aiguilles. 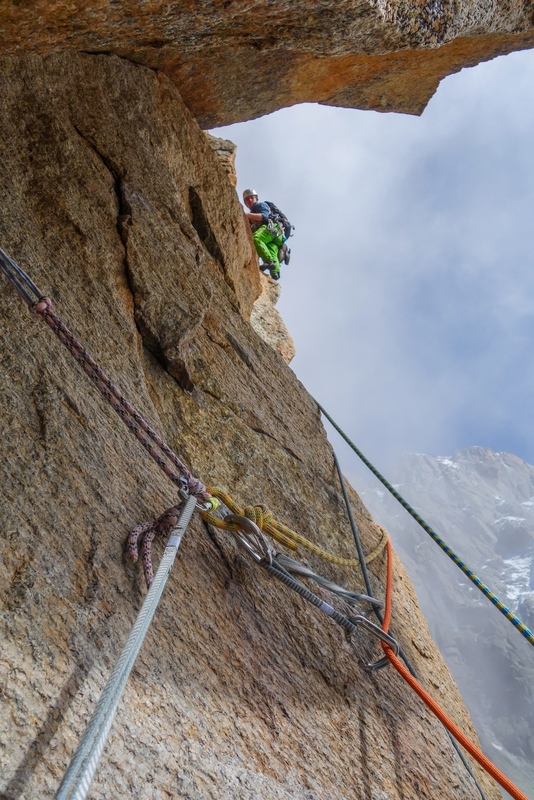 The Aiguille du Peigne holds an absolute gem of a route known as the Papillons Ridge – a soaring spine bristling with granite towers, aretes, corners, chimneys and slabs! We caught the first telepherique up and got cracking, the first easy section climbed moving together before starting the pitched climbing at a tricky squeeze chimney leading on to a knife-edge arete. This was just a taste of what was to come and before long we were totally absorbed in the quality of the climbing and outrageous situations on the crest. The short aid section was thought-provoking and eventually succumbed via the unorthodox lassoing of an in-situ iron stake and a lot of jibbering. The subsequent flying crack and hand traverse with nothing for the feet was, however, superlative! We had made good progress to this point but as time wore on we were gradually caught by some speedy moving alpinists from Catalonia. 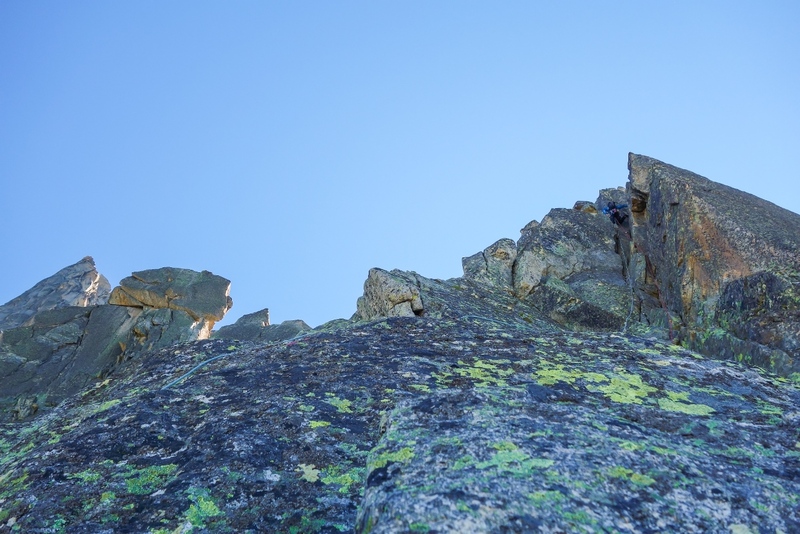 We let a team through ahead of the next difficult section and made our way to the crux of the route – a committing rising traverse out of a letterbox-like feature with nothing but air nibbling at your heels. 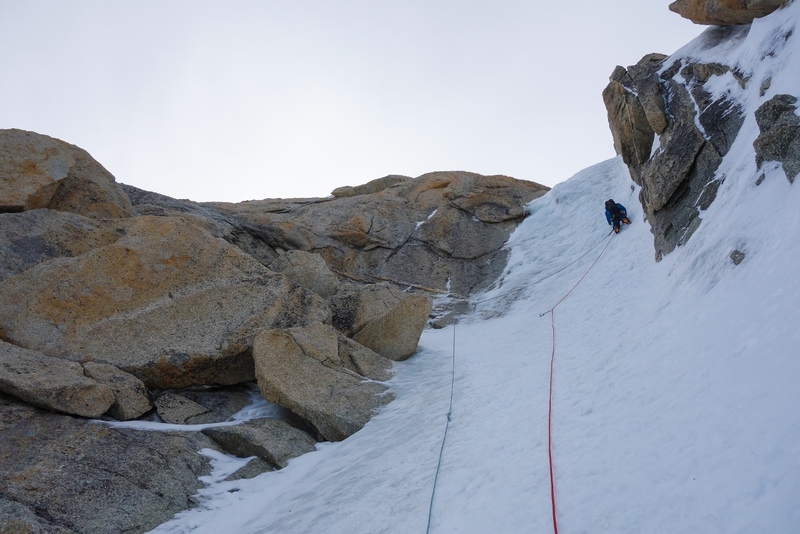 The descent was a little involved, requiring a long abseil into a gully, some scrambling, some more abseiling, some more scrambling and then finally the choice of an axeless glissade down the Peigne snow field or another abseil. 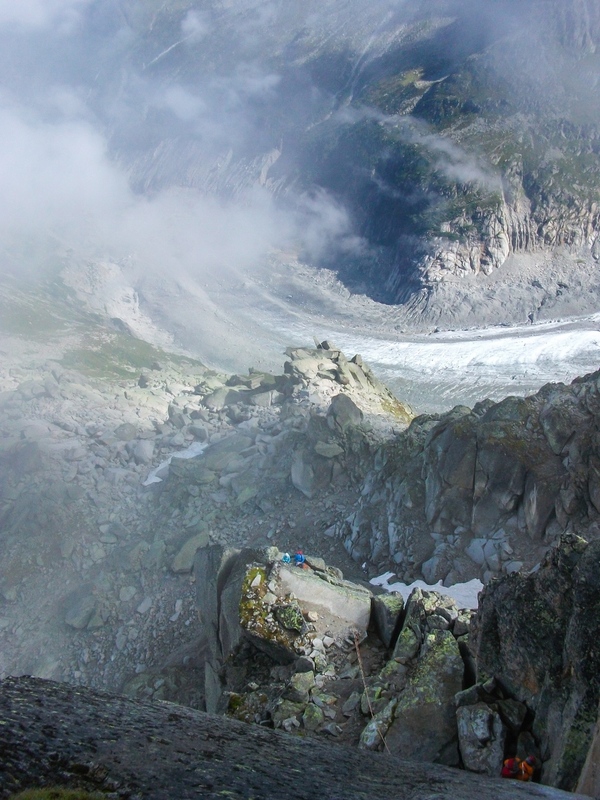 By the time all five of us were on the moraine we knew we were spending the night at the Plan de l’Aiguille hut. No bad thing really as the meal and subsequent nights sleep was one of the best I’ve ever had! The following day we descended back to Chamonix, repacked, refuelled and went straight back up on the opposite side once again. Debs, Lachy and I were keen for a route called Asia, famed for it’s high quality and sustained difficulty at the grade. Perfect! The crux is right off the ground, but Debs, after 4 straight days of climbing was in the zone and flew through it in excellent style. After 5 days of climbing mid-level rock routes the consensus was that it was time to get up high for some more traditional alpinism. 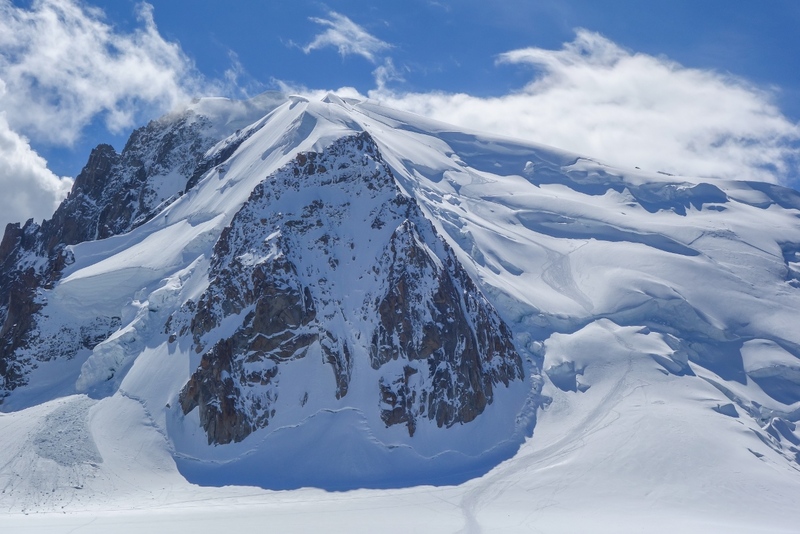 An easy objective was in order to aid acclimatisation in the event of doing something longer and harder later in the trip, so we settled on the Traverse of Pointe Lachenal. 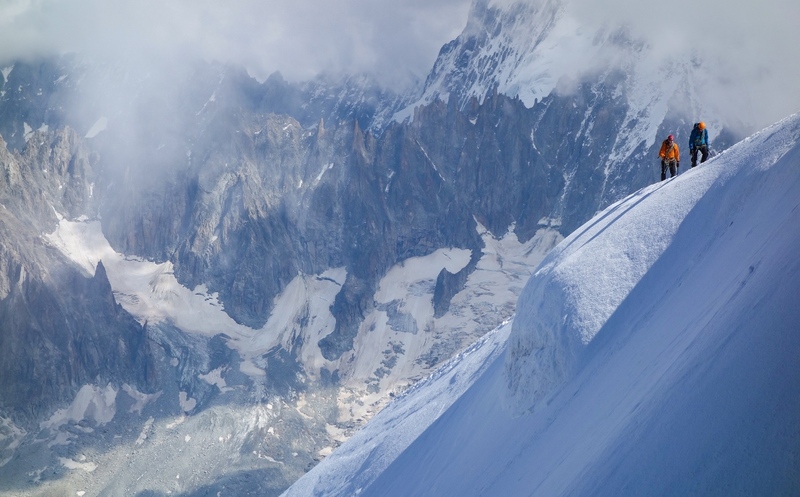 First, however, the infamous snow arete down from the Aiguille du Midi to the upper Vallee Blanche had to be negotiated. 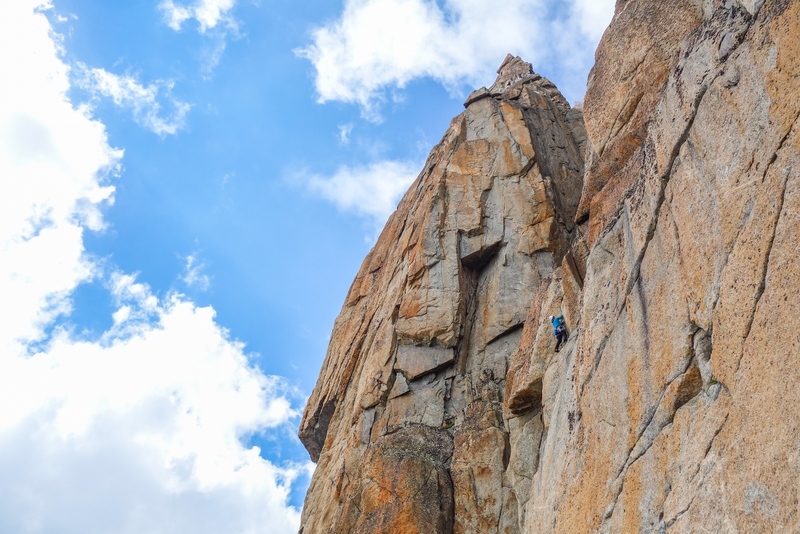 Last year the arete was relatively wide and very stepped out, but this time, after snow, high winds and much colder temperatures, we found a very different beast. Coupled with the low visibility, gusting wind and knowledge of the disaster a few weeks before, the descent was undertaken very carefully indeed. Having done the Traverse last year in very dry conditions it was nice to repeat it in more wintery garb. The route is very straight forward apart from a 40 m shattered chimney, which provided a lovely mixed pitch that we climbed at around Scottish IV, 4. 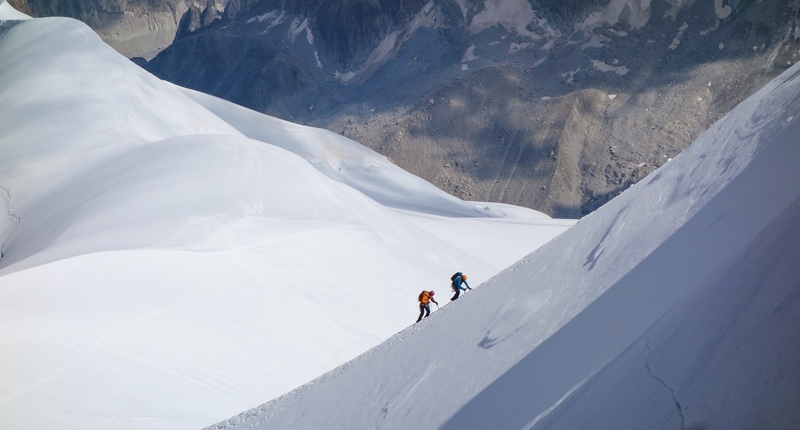 By now the snow had softened and the slog back across to the Midi was slow – I was certainly feeling the last 5 days! Ric and I plodded back up the snow arete, now thankfully a bit more stepped after the day’s traffic, to meet the other guys and descend to the valley. 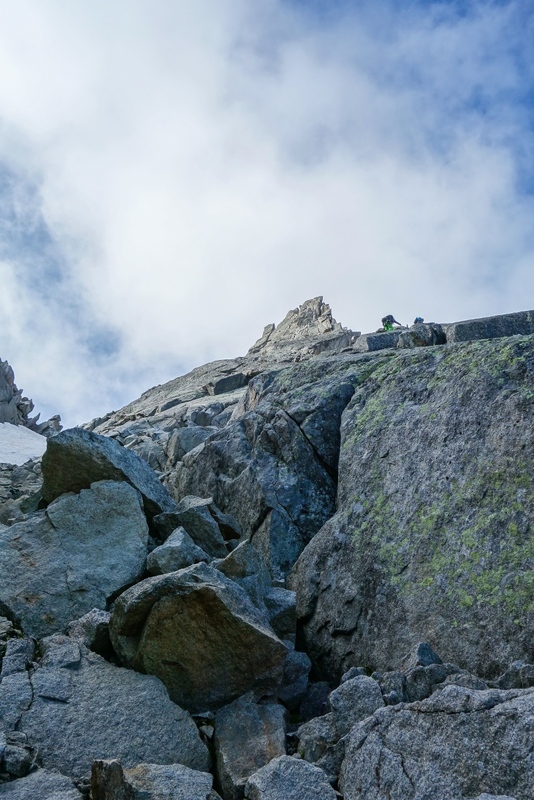 Having never been into the Argentiere basin before, Debs, Lachy and I decided a trip to the hut and an ascent of the South Ridge of the Aiguille du Genepi was in order. 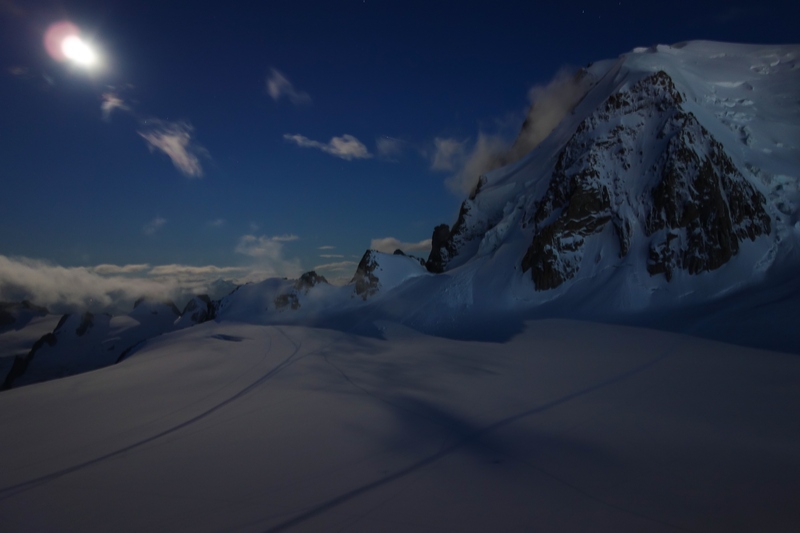 If nothing else we would get to see one of the world’s great alpine playgrounds and gaze upon the indomitable north faces of Les Courtes, Les Droites and the Aiguille Verte. We caught the lift up to the Grands Montets and after a bit of bergschrund banter made our way down the glacier and rognon to the huge Argentiere Glacier. We headed across this obliquely, aiming to hit the moraine a few hundred metres downstream of the hut. Unfortunately the banks were very steep and huge crevasses cut into the moraine just where we tried to exit the glacier. After some meandering, jumping and general sketchiness we eventually made it to the hut, eager for a rest and all the comforts a large manned hut provides. This would have been superb if the hut was actually open. We tried to make hay while the sun was still shining and headed up behind the hut to the foot of the Genepi. When it came to seconding the first pitch the previous 7 days of effort took their toll – I was done, totally wrecked. We had distributed all our gear into two sacks for the seconds, thus making it easier for the leader, but carrying this much weight wasn’t ideal. After struggling up to the roof I had to call it quits and lower off. As Debs and Lachy prepared to abseil, the first spots of what was to be a rainy afternoon began to fall and the clouds moved in. The route looked fantastic though and the mega-crystalline granite quite unlike anything I had climbed on before – one to come back for! 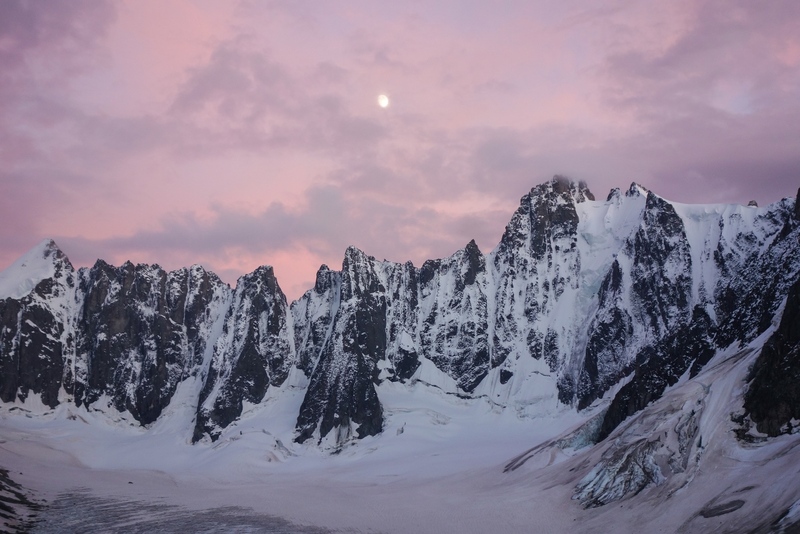 Evening light on the great north faces of Les Courtes, Les Droites and the Aiguille Verte. One day….. The moon rises over Pointe du Domino and makes it all worthwhile! After a cold night spent eating pasta, salsa and one-year-old mushroom soup, we climbed the 700 vertical metres back up to the Grands Montets lift and scuttled back to Chamonix. As Debs, Lachy and Andy were leaving the next day, they spent the afternoon packing before we headed out for the world’s best burger at Poco Locos to celebrate Lachy’s birthday and a great week of climbing! The following day Ric and I bade farewell to the others, caught the telepherique back up to the Midi and mooched leisurely over to the Cosmiques Hut. 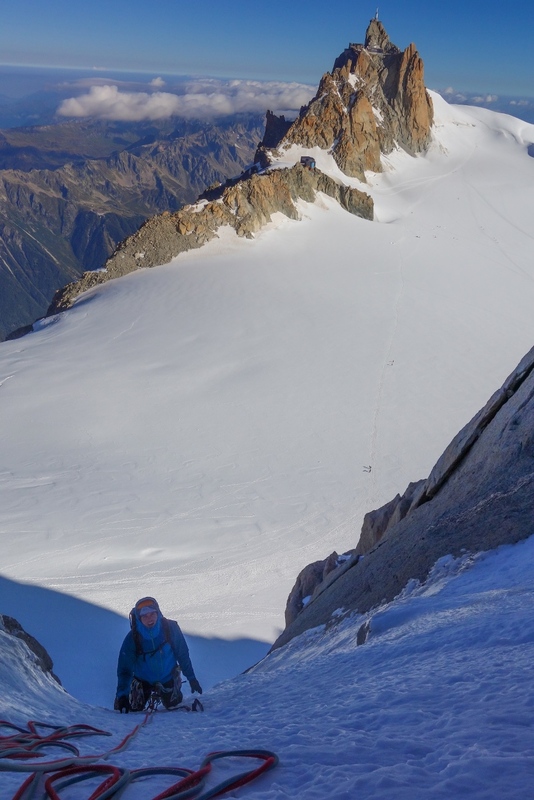 With a good weather forecast for the next day and rumours of stonking ice conditions on the North Face Triangle of Mont Blanc du Tacul, we had settled on the arch-classic Chere Couloir for our final route of the trip. With cold temperatures and an easy abseil descent in prospect, we knew we didn’t have to start in the dark so had a late breakfast at 05:00 before cruising over to the base of the Triangle. We encountered some of the best snow-ice conditions I’ve ever experienced – chewy enough for first time axe placements but hard enough to take reliable ice screws when you needed them. Perfection! The two steeper sections were entertaining, providing 20 and 15 m sections of 85 degree ice. A final short pitch brought us to the end of the gully and the start of the abseils. 5 of these took us down over the bergschrund and back to the Vallee Blanche. We were delighted to cap our alpine adventure off with such a great route! After lunch and medals at the bakery we packed up our kit, thoughts already turning to the next part of the holiday – the boulders of Fontainebleau were waiting….